C3: 5 Modern Temps: Unprecedented or Similar To Past? Facts Don't Lie: Unexceptional Global Climate Warming In The U.S.
Is there dangerous, human-caused global warming affecting the climate of the continental U.S.? As reported by NOAA, the adjacent plot of monthly 1,419 months) maximum temperatures experienced in the U.S. corn belt, a major agricultural breadbasket region, since 1900 is rather unremarkable. As can be seen, maximum temperatures peak and then they don't. The 5-yr average (60mth avg.) red curve tells the story: despite huge global emissions of the greenhouse gas, the U.S. breadbasket has a narrowly stable maximum temperature pattern. And, amazingly, the maximum temperatures of this large region during the 21st century still DO NOT exceed those experienced in the early 20th century. Conclusion: As discussed in the prior article, [Ed: meant to link to this prior article] unusual and unprecedented dangerous "global" climate warming is not close to being an empirical reality. As the U.S. corn belt reveals, every regional climate is different - they experience major warming and cooling periods for different reasons, at different times, and at different rates, regardless of the global atmospheric CO2 levels. Climate Apocalypse: Is The Current Climate Warming Unprecedented In Modern Records? Empirical evidence review: It has now been 30 years since the former chief NASA climate scientist, James Hansen, unleashed his climate apocalypse scenarios on the public in 1988 ... looking back, does the empirical evidence support the fears of "unprecedented" warming? It has long been common knowledge among both scientists and laypeople that the world has been warming since the Little Ice Age (LIA) ended during the mid-1800s. In fact, from January 1850 through January 1988, the world had already warmed over 1 degree Celsius. And it was in 1988 that James Hansen decided to present the case that this slow warming since the LIA was soon to become "unprecedented" due to CO2 emissions, thus causing untold climate chaos - i.e. boiling oceans, droughts, famines, Manhattan Island flooding along with other coastal regions, Earth turning into the next Venus, and etc. Factually, the world has continued to warm since 1988, but is it "unprecedented" versus the climate warming of pre-1988? It's not enough simply to claim the world is warmer, more important is to determine if temperatures changes are larger than ever. To determine if today's global warming deserves to be considered unprecedented, an analysis of 30-year (360-month) climate temperature changes would be an effective means. Using the gold-standard surface temperature record dataset, the HadCRUT4.6 global anomalies stretch back all the way to 1850. We know from that dataset that the modern 30-year climate temperature change was +0.29ºC of warming at the end of February 2018. To clarify, that is the temperature warming change from February 1988 through February 2018. That +0.29°C temperature since 1988 change took place in a global climate context that included not only the impact of multiple powerful El Niños, but also an atmosphere that was infused from 1989-2016 with over 50% of the total human CO2 emissions (metric tonnes) emitted since 1850. Yet, despite all those CO2 emissions over the last 30 years, as the adjacent table reveals, there are 28 previous 30-year changes all ending in the month of February that exceed the "unprecedented" the most +0.29°C change. All 28 of those 30-year temperature changes took place before the additional 50% of all CO2 emissions were released into the atmosphere. By expanding the analysis to include all 12 months - not just the month February alone - there have been 247 monthly instances prior to 1988 when long-term the 30-year global temperature warming change exceeded that for February 2018. In contrast to the above, the 30-year change in CO2 ppm as of February 2018 significantly exceeds all 30-year CO2 changes prior to 1988 without fail. As an aside, in regards to the short-term, the 12-month global temperature change was a minus -0.32°C for the month-end of February 2018. True: The world has warmed since 1988 as the global temperature dataset establishes. But, per the same empirical evidence, the current modern warming, as represented by 30-year temperature increases, is not in the least extreme, unusual, or unprecedented. Prior to the additional 50% of total metric tonnes of CO2 emissions being added to the world's biosphere, global warming change easily matched or exceeded that experienced since 1988 - the year of NASA's James Hansen's predictions of climate apocalypse from human CO2. Based on all the the gold-standard temperature measurements that the HadCRUT dataset provides, it is evident that periods of exceptional global warming changes (and the recent cooling temp changes) are more likely driven by natural forces than the ever-increasing levels of atmospheric CO2. Note: Excel used to calculate 30-year temperature changes from the HadCRUT global land/sea dataset of temperature anomalies and past CO2 data (links found here). Left column of table are months of February and associated year; right column of table are the 30-year changes in temperature anomalies. 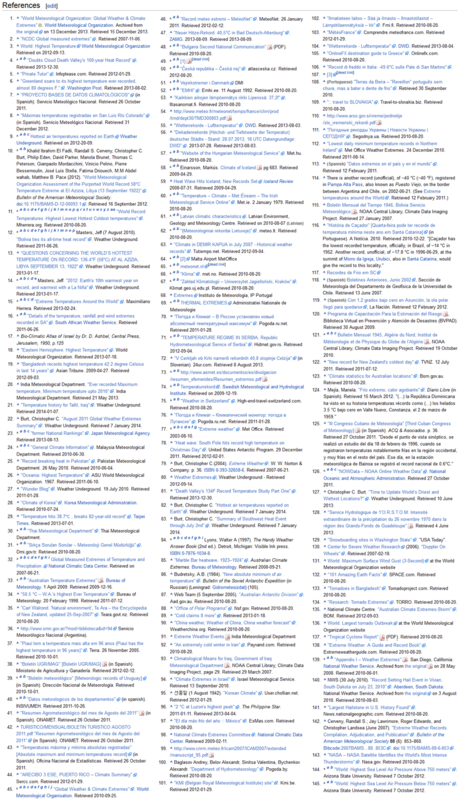 Only chose to show the sub-list of February examples instead of all months, which was comprised of 247 in total. China is the 4th largest country in terms of geographical size and the largest in population size. Accordingly, human-induced climate change from greenhouse trace gases would be of major concern to China's leaders. So, what does a fact check reveal of China's modern climate change due to human Co2 emissions? Frankly, little, if any, emission impact on present climate change based on new Chinese peer-reviewed research. The chart on the left represents a 341-year proxy temperature reconstruction for the southwest region of China. Clearly, unprecedented temperatures occurred during the mid to late 1700s. This record shows that modern temperatures, which supposedly have been influenced by human emissions, are yet to rival temperatures from much earlier periods. Also, one can discern a cyclical pattern that the study's scientists attributed to nature climate oscillations - trace greenhouse gases do not explain this periodical climate pattern. The chart on the right represents a 500-year streamflow analysis for a western region of China. Again, a pattern of constant change, from low to high to low, appears to be due to natural climate variations. The late 20th and early 21st century observations seem remarkably similar to those in the distant past, suggesting that Co2 emissions are not a factor influencing streamflow. Fact Check: As these two studies from China indicate, modern industrial/consumer emissions from fossil fuels are not a major component of climate change. This research adds to the huge compilation of prior peer-reviewed studies that confirm modern climate change is not out of the ordinary, and highly likely due to natural causes, not human-induced as speculated my many. The extremist green movement is the principal driver behind the story that recent climate change is the result of humans - more specifically, the result of consumer/industrial fossil fuel emissions. Indeed, the fringe greens claim that modern global warming is solely caused by CO2 from coal, oil and gas combustion. Plus, they claim that natural climate change has had almost zero influence on temperature changes over the past 30 years. Yet, the empirical evidence from NOAA does not support those claims. In fact, one could surmise that the greens' claims are refuted in many instances. Using the U.S. temperature dataset from NOAA, which represents evidence from the most comprehensive climate reporting system in the world, a reality-based version of past and present temperature change emerges. Most recently, we know that the super El Nino produced a 3-month winter period (Dec-Feb) that reached its highest winter average ever by the end of Feb. 2016. And amazingly, using a larger subset of the same dataset, the 5-year temperature trend ending Feb. 2015 is actually negative, cooling at -3.5°F/century rate for 12-month periods. Now, the 3-month warming event and 5-year trends are absolutely worthless as predictive tools, but for comparison purposes they can be instructive. For example, the 5-year trend ending in February 1935 was an extreme +28.6°F/century versus that recent -3.5°F/century trend. Those 5-year periods are the first instructive clue that the early 20th century climate change was extremely powerful, without any influence from large CO2 emissions. The significantly higher early climate warming rates versus modern warming are not only unexplained by experts, but also by the computer climate models that have become known for being utter flops. This has resulted in a lot of embarrassing hand-waving distractions and "don't look behind that curtain" responses. Expanding on the comparison of natural versus modern warming rates, the chart on the left plots various per-century trends for US temperatures ending February 1935 (red curve) versus those periods ending February 2016 (aqua curve). Note that in all cases (5yr, 10yr, 15yr, 20yr, 25yr and 30yr) the warming trends of the early 20th century natural climate change ending on Feb. 1935 exceed (sometimes by a lot) the modern warming trends ending Feb. 2016. How can this be one might ask? 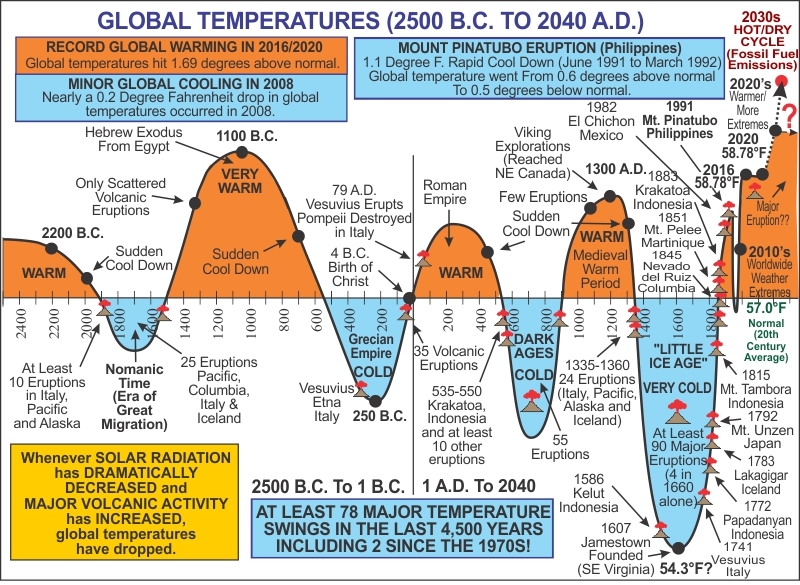 Well, in a nutshell, the anthropogenic global warming hypothesis, which is at the center of modern climate-doomsday scenarios, cannot explain the powerful warming of the past. The AGW hypothesis essentially ignores the relevance, the strength and the significance of all natural climate change resulting from internal and external forces. Thus, as previously mentioned, "experts" and computer simulated predictions have egregiously failed. The AGW hypothesis is driven by the assumption that atmospheric CO2 levels produce the rapid accelerating warming trends that are so feared. However, if CO2 was the sole cause of global warming, then the chart on the right would be the supporting evidence, except it isn't. The chart on the right plots changes in CO2 atmospheric levels for the the two comparison periods. Visually, the periods ending on Feb. 1935 and Feb. 2016, reveal the huge disconnect between the AGW hypothesis of CO2 climate warming and the actual evidence. Over the last 30 years, the modern change in CO2 ppm levels is over 5 times greater than that experienced spanning the 30 years ending in Feb. 1935. Yet, as noted before, major period warming rates for the early 20th century easily exceed those of the modern CO2 "doomsday" era. This past U.S. climate experience of extreme warming provides unequivocal evidence that natural climate change is variable and strong enough to easily explain the milder modern warming trends over the last 30 years. As an aside, the press is constantly spreading the meme of the 'warmest', be it warmest day, month, quarter, year, decade and etc. Many times what they report is true in one sense but they forget to mention that it has been warming since the Little Ice Age. And today's reporters conveniently fail to mention that reporters of the 1930s' were saying the same for their period of extreme climate change. Finally, NOAA reports that there exists a minor U.S. cooling trend of -0.7°F per century since 1999 - based on the past eighteen 12-month periods (18 non-calendar years) ending February. Note: Source of U.S. NOAA temperature dataset (12-month periods ending February: choose 12-month time scale); modern CO2 dataset and pre-1958 CO2 dataset. Excel used to plot charts and to calculate temp trends and CO2 changes. The short version: NOAA's latest empirical evidence reveals that last 25 year period of global warming is not exceptional, nor unprecedented. Unexpectedly, NOAA's own evidence debunks their own global warming propaganda that they claim is fact. Yes, the warming isn't exceptional but the irony certainly is. NOAA is well known to aggressively push the misleading myth of a dangerous modern warming rate from CO2, and that this rapid warming can only be man-made, not a result of natural forces. Yet its own temperature dataset proves past natural global warming rates of earlier periods are similar and as powerful. And of course, NOAA always conveniently forgets about the substantial warming and climate change periods of the historical and geological past, which far exceed what NOAA has reported over the last 25 years. The long version: Unprecedented modern warming? A simple factcheck of NOAA's temp information proves otherwise. With a multitude of politicos, greens, activists, pundits, journalists, and wildly uninformed celebrities jointly wringing their hands over 2015 being the hottest ever, it's beyond empirical doubt that the rate of the last 25 years of warming is not unique. Yes, in a nutshell, it's warmer today than 25 years ago, but that's to be expected due to the 150+ year natural rebound in temperatures since the extreme cold of the Little Ice Age. Putting aside the overused "hottest" adjective, does NOAA's empirical measurement prove that modern warming is significantly different than past natural warming? Have the last 25 years warmed a quantifiably greater amount than prior periods? To the charts of NOAA empirical evidence to compare two 25-year climate periods of global warming. Chart #1: For ease of comparison, the earlier 20th century monthly anomaly sub-dataset was offset so as to start at exactly the same anomaly point as the modern sub-dataset. When that is done, it is easier to visually match the similarities/differences of the two warming periods. Despite their obvious differences in anomaly variation, these two distinct periods reflect similar outcomes over their respective 25 years. Even though the earlier 20th century period (1919 to 1943) experienced little in the way of consumer/industrial CO2 emissions, its monthly warming anomaly increase is almost a perfect match to the last 25 years, ending 2015. The chart's fitted trends (2nd order polynomial) reveal the earlier period with a closing warming rate that is accelerating away from the modern fitted trend. Chart #2 plots the calculated linear trends for both 25-year periods. The difference in 'per century' trends is rather minuscule, especially when considering the massive greenhouse gases released into the atmosphere since 1950. Objectively, the small trend increase of +0.40 degrees per century over the last 25 years is well within known natural variation. Clearly, any warming impact of CO2 emissions has barely surpassed the per century trend produced by natural climatic forces from 1919-1943. Based on this empirical evidence, a robust conclusion would be that the CO2-centric AGW hypothesis is exceptionally insignificant. Chart #3 compares the 5-year average warming for each period, using the same starting anomaly point. From the start, the ‘Modern’ 5-yr average rises much faster; but in an exceptional (dare we say "unprecedented") spurt, the ‘Earlier’ period 5-yr average closes the gap to a mere +0.03 degree warming difference at the end of 25 years. Based on that tiny difference, one can fairly surmise that the huge CO2 emissions production over the last 25 years has not distinguished itself as climatically significant versus natural variation. And it is interesting (and somewhat unexpected) that both the ‘Earlier’ and ‘Modern' periods had extended pauses, which are noted on the chart #3. Chart #4 depicts the cumulative temperature change for the full 25 years (300 months) ending in 1943 and 2015; plus, their respective changes in CO2 levels. Per NOAA’s own empirical dataset, the earlier 20th century warming cumulative amount was actually greater than the modern era period ending in December 2015 — and remember, the December 2015 temperatures anomaly just had an incredible surge due to the current El Niño peak. In conclusion, as stated in the first paragraph, modern warming over the last 25 years is not exceptional, nor unprecedented in spite of the gigantic accumulation of atmospheric CO2 emissions during the fossil fuel era. Based on real world climate and the actual evidence, simulated predictions of future dangerous warming remain without any scientific substance. Notes: The period of 1919-1943 was chosen for analysis and comparison due to its visual pattern similarities to the last 25 years ending December 2015. Source of NOAA global temperature dataset; modern and historical CO2 datasets. Excel was used to plot and calculate trends/averages for all charts. Chart#1 had 1919-1943 anomaly plot adjusted to start at same anomaly point as 1991-2015 period; chart#2 linear trends are based off plots of chart#1; chart#3 uses 5-year averages calculated from each period's anomaly dataset and then the 1919-1943 5yr average was adjusted (i.e. offset) to start at same anomaly point as 1991-2015 5yr average; chart#4 cumulative differences calculation: the December 31, 1943 anomaly minus the December 31, 1918 anomaly and the December 31, 2015 anomaly minus the December 31, 1990 anomaly (both calculations covering a full 300 months). Using the UK's MetOffice global HadCRUT4 (HC4) dataset as a proxy for long-term climate change, it allows for a breakdown of when such changes occurred. For this article's definitional purposes, long-term change is defined at those points where the HC4 30-year global average shifted to a new level (up or down) by 0.1°C, for at least 12-months in a row. The adjacent chart depicts those ±0.1 changes. As can be observed, there have been a total of 10 shifts since the 1850-beginning of this global instrument dataset. There was a shift down in the global 30-year average starting in July 1909, for a period that extended to October 1928. The next full 0.1°C shift arrived in November 1928 when the 30-year average increased by 0.1°C, attaining its previous level. That was then followed by 3 more shifts, each of different lengths. Then the same exact pattern of shifting repeats, with 1 cooling shift followed by 4 warming shifts. The warming since the end of the Little Ice Age (LIA) did not have a major impact on long-term HC4 averages until the early 1900's. Natural global warming since the LIA-rebound started has not been consistent, nor even predictable. As represented by the 30-year global average shifts, the first span of global warming (consisting of the first 4 shifts up) was very lengthy, reaching all the way into the 1970's - this long span being primarily well before the gargantuan consumer/industrial CO2 emissions from the late 20th century of the modern era. The amount of long-term increase for the last 4 shifts equals +0.4°C, the same as the earlier 'up' shifts, but it occurred over a shorter time span. Does all of the above mean that the future will be an exact repeat of the pattern? Well, the definitive answer to that is 'no'. There is no denying that, in general, modern climate change closely resembles what has taken place in the past. The similarities are evident, despite short-term climate variations that produce observable differences in duration, levels and intensity. As the latest peer-reviewed research indicates, modern climate scientists are finally rediscovering (for example and example) the climate truths that their predecessors were aware of: natural earthly/solar/cosmic forces produce repeating (and similar) climate oscillations/cycles, creating dominant influences that dictate overall patterns for long-term climate change. Yes, the human influence does exist, but it is a distinctly minor player in the long-term scheme of climate patterns. And because these amazing pattern similarities happen in a chaotic system, they can neither be predicted, nor controlled. Those stubborn facts are continually ignored by advocates of human-caused climate change predictions. Note: This monthly temperature dataset and Excel used to calculate moving 30-year averages. First, monthly anomalies were used to calculate a 12-month average for each month. Then using an estimate of 14.0C for the global temperature average of the 20th century, 12-month absolute temperatures were calculated from the calculated 12-month average anomalies. Finally, 30-year (360-month) absolute global averages were calculated. Excel's rounding function used to identify ±0.1C changes. Any political success that is achieved by deceit, hyperbole and hysteria always requires a sacrifice of the empirical evidence and unbiased science. Yet it is scientific facts and methodologies that ultimately win...it follows that the public can only be mislead for so long. Despite the extremist hyperbole and doomsday-cult scenario hysteria, the science of climate change is rather mundane, from a long-term view: it gets cold and, OMG!, then it gets hot, with some periods of in-between. Climate change is constantly in play; and humans can no more stop its chaotic version of ebbs and flows, let alone ever controlling a single cloud, thunderstorm, hurricane or tornado. This chart, from the science journal New Scientist, is a prime exhibit of real-world scientific evidence that reveals how inconsequential today's climate change is compared to all previous climate change. From the chart, it is clear that extreme climate change is a constant; there have been much higher and lower temperatures in the past; modern climate temperatures are not excessive in the least; and, the purported human-induced, "dangerous" modern temperature warming is only a fraction of past natural increases. We say purported, because our existence is taking place during a global cooling phase (look at chart closely and note the pale blue areas) which is rather long-in-the-tooth, and at some point would normally rebound to warmer temperatures, just naturally. Indeed, the entire warming since the Little Ice Age is likely to be predominantly a natural response to the prior millenniums of extended cooling. As the chart's inset clarifies, the modern warming since the end of 1949 has been very modest, being completely within the bounds of previous ancient and geological warmings that have been identified by empirical science. The atmosphere has not experienced statistically significant warming since March 1996. The oceans have not experienced statistically significant warming since August 1994. The globe has not experienced statistically significant warming since November 1996. Memo to GOP elites: Do not just passively accept the climate-liars' exaggerations, hyperbole and factual misrepresentations. The public wants the science facts; they want evidence that challenges the mindless, ludicrous fear-mongering. Crush the Democrats' hysteria with the real science; and denigrate their junk science predictions generated from the failed computer climate models. Facilitate the flow of scientific empirical evidence and debate - hmm...it's called educating the public, eh? Additional historical, modern and regional temperature charts. Note: Added the red and blue lines to above New Science chart. The added lines represent the HadCRUT4 global 60-month average temperatures at December 1855, December 1949 and July 2014. Of course, the CAGW argument has been (and continues to be) that huge CO2 emissions have produced extremely hot weather records during the 1980's, 90's and the 21st century, so far. But is it true? Well, as pointed out earlier this year, the feared global warming is not producing the proclaimed hotter temperature records across the world. And for the U.S.? NOAA confirms the same through June 2014. It is empirically true that the climate alarministas fear-mongering about record-setting extremes are without merit. Case in point. This collection of charts depict NOAA's climate record frequency for maximum monthly temperatures across the contiguous U.S. Figure #3 reveals that there have been zero months in the U.S. since 1980 that have had over 90 degree monthly averages. In contrast, the 1930's had two. In addition, for the period prior to 1980, there have been 57 months that averaged over 85 degrees while the period since 1980 there have been only 54. Figure #4 plots the 60 hottest months for the two periods. Clearly, the pre-modern era produced hotter monthly records. These top 60 month plots represent the extreme 14.3% of each respective period. For CO2 context, total global CO2 emissions are listed for each period (past and modern) on figures #1 and #2. The modern era emission tonnes are higher by a factor of 5+. The evidence could not be clearer. Huge CO2 emissions, and higher atmospheric CO2 levels, do not correlate with a greater frequency of higher monthly maximum temperature records. This is indisputable. Does this mean there won't be new record maximum temperatures set in the future? No, it does not. But, with that said, it is highly probable that future maximum records and their frequency have absolutely zero to do with greater CO2 emissions. Addtional regional and modern temperature charts. Note: Source of U.S. maximum monthly temperatures since 1895 (choose Maximum temperature; choose 1895 and 2014; choose Previous 12-months; choose June; click plot button; scroll down and click Excel icon to download data; in Excel, select period june 1920 thru june 1964 and period june 1980 thru june 2014 (these are the two 409-month periods used in charts);and then sort each period by largest to smallest monthly temperatures. Modern CO2 emission tonnes and past emission tonnes. As almost everyone (alarmists and skeptics) agrees, climate change is continuous, accompanied by associated temperature changes. Based on the common measurement techniques utilized, over the last two decades the globe has warmed. However, with that said, the last 15 years of global warming has really not been too impressive - so unimpressive, that scientists are debating speculating what happened to it. In fact, when examining the moving 15-year temperature changes over the last two decades, the NASA research indicates (despite the gigantic modern human CO2 emissions) that pre-1950 global temperature changes were greater. Yes, you read that right. When examining absolute 15-year changes in temperature, our modern warming doesn't quite measure-up to earlier warming. The adjacent chart plots 15-year (180-month) absolute temperature changes (i.e. differences) of the two decades 1924-1944 (starting July 1924, ending June 1944); and plots the 180-month temperature changes of the two decades from July 1994 to June 2014. As the chart indicates, both periods have similarities, but the greatest long-term global warming took place prior to 1950. The linear trends on the charts denote the continuing acceleration of 15-year warming (red straight line) for the pre-1950 era, versus the decelerating trend of our current times (green straight line), as reported by NASA scientists. And, as can be observed, both the long-term warming and cooling extremes were greater during the pre-1950 decades. Confirming the pre-1950 weather/climate extremes is rather easy - just read the headlines from that era. Conclusion: Modern climate and temperature change is somewhat tepid when compared to the natural extreme changes during the 1930s and 1940s. It would seem that human CO2 emissions are not causing unprecedented, accelerating extremes in modern weather and climate over recent 15-year spans, and may actually be dampening the extremes when compared to the past. Additional modern and regional temperature charts. Note: The above chart is comparing the 2 decades ending June 1944 versus the 2 decades ending June 2014 - both periods exhibit identifiable warming. NASA dataset used for the moving 15-year (180-month) absolute temperature difference comparison and Excel chart. Hey, don't know how to chart in Excel? It's easy to produce charts - you can do it too! Go here to learn how. Regarding claims of "irreversible" and "accelerating" global warming, the scientific empirical evidence (analysis of monthly measurements) comparisons is indisputable: over the last 15+ years, global warming has gone AWOL, which the climate "experts" are mystified about. Ergo, modern global warming has been in a non-accelerating state, a status reversal taking place since the late 1990's. Here and here, the scientific evidence from NOAA, when analyzed from a 5-year climate change viewpoint, clearly shows that both modern U.S. and world-wide warming are not "unprecedented" when compared to earlier 20th century periods. Moving on to a different perspective, the adjacent chart documents that modern atmospheric CO2 levels growth was approximately 6 times greater than during that of the pre-1950 period. Yet, this immense growth of modern emissions barely produced an uptick in 10-year global warming averages, when compared to a similar time span for the pre-1950s. This is the undeniable result of an analysis of the UK's HadCRUT4 global climate record dataset. The difference between the two period's 10-year average increase was a trivial +0.1°C - that's well within the range of what natural climate variation could explain. If HadCRUT3 datapoints were used instead, the difference shrinks to +0.05°C. These differences are meaningless; of no material, meaningful climate consequence; and, totally undeserving of the label "unprecedented." Climate Change FactCheck Summation: Analyzing 1,853 datapoints of moving 10-year average global temperatures establishes there is no significant empirical evidence from the gold-standard HadCRUT4 climate records that would even suggest that modern-era warming deserves the "unprecedented" designation. 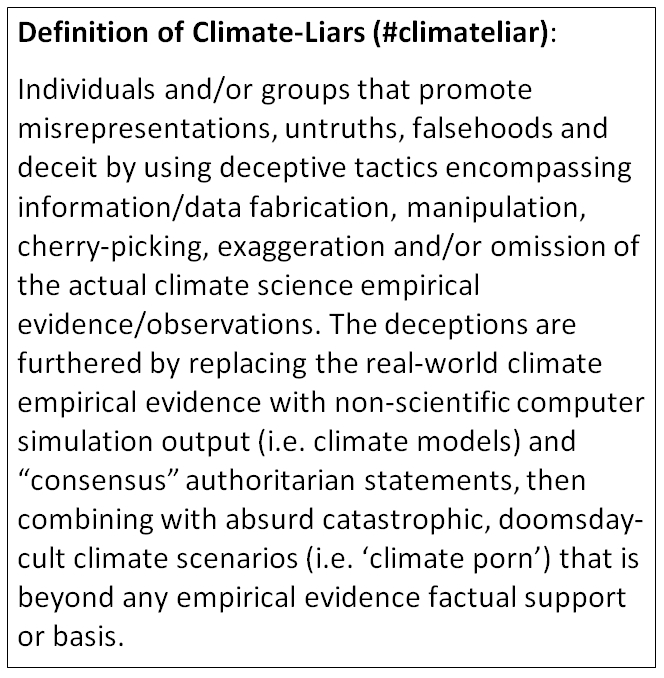 Simply stated, scientists and politicians utilizing that adjective are intentionally being deceptive in order to solely advance a political agenda. Likewise, the deceptive use of the descriptors "accelerating" and "irreversible" are also not supported by any scientific evidence. From a 10-year average global temperature low, established during November 1976, the modern warming period spanned 410 months, ending during December 2010 when the 10-year average peak occurred. The pre-1950 (prior to the huge 'modern' consumer/industrial CO2 emissions) 10-year average temperature peaked during May 1945. Creating a similar 410-month span, establishes April 1912 as pre-1950 low point for this apple-to-apple comparison. The atmospheric CO2 level (ppm) growth amounts depicted by the chart are based on these two 410-month periods. Previous modern global, regional and historical temperature charts. Note: NOAA global temperature dataset and Excel used to produce above infographic and 10-year averages; or download original data from this site. Hey, don't know how to chart in Excel? It's easy to produce charts - you can do it too! Go here to learn how. The gigantic consumer/industrial CO2 emissions during the modern era are claimed by “consensus” climate scientists to have caused rapid, accelerating, unprecedented dangerous warming, never experienced by humans before. But is this claim really true? Does climate reality support the catastrophic climate change hyperbole? Nope. But you be the judge. If CO2 emissions really matter, then their impact should be robustly apparent when analyzing long-term 5-year global climate warming averages. Simply stated, the differential impact from the gargantuan, modern CO2 emissions on global 5-year average warming should be significantly greater than pre-modern, natural warming for 5-year averages. But that’s not the climate reality. Surprised? As the adjacent graph of NOAA empirical evidence (5-year averages) reveals, the alarmists’ hyperbolic claims are without any scientific merit. The amount of modern warming (red dots) is nearly identical to the earlier 20th century warming (blue dots) that took place in the absence of large CO2 emissions. In fact, the 381-month periods plotted in the graph have the earlier period warming to be just slightly higher (+0.01°C) than the modern warming. To simplify, that’s totally contrary to what the UN’ IPCC and the major US and UK climate agencies have claimed and still widely promulgate. For those more interested in the details of the chart’s plots, we move to a more complete description below…to the details! Why was a 381-month (31.75 years) period chosen? Simple. Prior to 1950, the 5-year moving average of global temperatures peaked during October 1944. That peak was reached over a span of 381 months, from the starting trough low point of the 5-year average that occurred during February 1913. Voila, 381 months. The modern 5-year average peak happened during January 2007. Working backwards to create a similar 381-month span, the start month for the modern period span is May 1975. In order to produce a visual apple-to-apple comparison of the amount of warming for the two periods, the prior period’s 5-year averages were offset to start at the exactly same point as the modern warming period (‘offsetting’ the datapoints does not affect the slope of the earlier period’s warming trend, nor the amount of warming). So what happens when the period span is changed to 300 months (25 years), using the same peak months as before (October 1944 and January 2007)? It swings in favor of the modern span of warming – by incredibly the same amount of +0.01°C. And what if the comparison’s NOAA-benchmark was the trough-to-peak warming span of November 1976 to January 2007, a 363-month span (30.25 years)? Compared to a similar 363-month period, working backwards from October 1944, the modern warming was only +0.06°C higher, which is smaller than the error bars of a standard thermometer measurement. Yep, no matter how one slices and dices the 5-year average warming amounts, the modern era’s warming represents an increase not even one-tenth of a degree greater than the pre-1950 warming – it is not only a statistically worthless difference, it is completely climate insignificant. What’s the essential point here? Those stubborn facts: Well, the amount of trough-to-peak modern warming is almost identical to the amount of pre-1950 trough-to-peak warming, which is clear indication that the modern warming was likely due to the same natural influences, regardless of the amount of human CO2 emissions. Certainly, one can’t conclude that CO2 does not have some role during warming periods, but NOAA’s empirical science research indicates it is ‘best practice’ science to conclude that the vast majority of modern warming was a result of non-human reasons. Note: NOAA global temperature dataset and Excel used to produce graphs and 5-year averages; or download original data from this site. Hey, don't know how to chart in Excel? It's easy to produce charts - you can do it too! Go here to learn how. Recently, the climate change myth that global warming is "accelerating" has been shattered by the near-zilch warming for the last 17 years - indeed, to the point where even climate change alarmist scientists are being forced to admit that 'the pause' remains unexplained. Another climate myth that can no longer weather the empirical storm is that human CO2 emissions have created an "unprecedented" global warming change regime. Of course, this myth completely melts when contrasted to previous climate warmings during ancient and historical periods. Yet, it is still a widely accepted myth for periods since 1980 - that human CO2 has caused unprecedented temperature increases, far outpacing any previous 20th century warming increases. That is not true, though, per the NOAA empirical evidence of the climate record. The above chart depicts the last 100 years of global warming increases, segmented by two 50-year periods, which handily exposes the lameness of the myth. The column on the left shows the cumulative NOAA temperature change over 50 years, starting in 1914, including the atmospheric change in CO2 levels (black vertical bar) over that same 50 years. The column on the right represents the same information, but instead for the 50-year period starting in 1964. One does not have to be a climate "rocket" scientist to recognize that the earlier 20th century warming increase was greater than the modern warming. And it is painfully clear, even to proponents of this myth, that the earlier warming increase took place while the CO2 level change was a fraction of that during the modern 50-year period ending in 2013. From this actual NOAA/NCDC climate record, one can fairly surmise the following: First, modern global warming change is not accelerating, nor unprecedented. Second, that natural climate change is most likely responsible (see Nature science journal article) for the majority of warming increases experienced during the two 50-year periods, not human CO2 emissions.